The profiles below are the founding members of the Herd. They are the inspiration which drove the establishment of HeartsHerd Animal Sanctuary and Rescue Center. 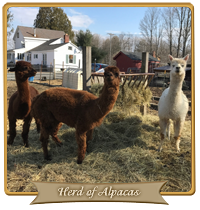 Although they are “permanent residents” due to their circumstances, they are still ready to share their hearts and affection with visitors and through your sponsorship. 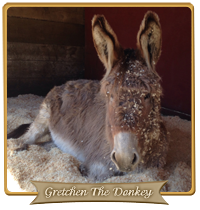 Interested in sponsoring any of our Permanent Residents? Click here to contact us and we will get in touch to connect you with your new special friend. GRETCHEN was to be sold at a meat auction, her eyes told us different. OSCAR was a wonderful Christmas surprise. 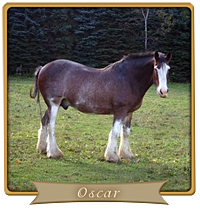 He had been purchased as a lead horse for a team of Clydesdales but was too “lazy” to pull his weight. We were able to get him for a very reasonable fee instead of him going to auction. 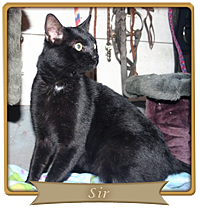 SIR is thought to be one of our own but showing up with some “extra baggage.” He is now baggage-free and staying! 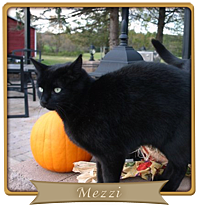 MEZZI was found in the hood of our car. She made it into the side panel. We never made it to work but we did finally get the car back together. 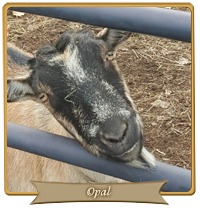 OPAL came to us when her owner’s wife’s health took most of his time. He wanted a loving place for his goat to go to. 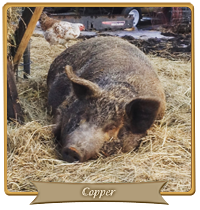 COPPER the wonder pig. He’s so sweet that his breath smells like maple syrup… seriously. He came to us because his family was raising him for meat but then became too attached to him. He was raised on a long chain. The family divorced and needed to find a new home for him. MARCUS, KAHLUA and FUNKY MUSIC are rescues from a hoarding situation, along with two other males but they were adopted! Their teeth, hooves and fiber/wool were over grown but now they’re back to good health.